There is a difference between small ‘r’ reply and a big ‘R’ reply all. There seems to be a group that insists on the “me too”, “count me in”, “+1” emails. This existed in grad school, it was particularly prevalent at Microsoft, and seems to continue. Maybe it is that I use 3 email address, the first I started using in 1994, the second in 2001 and the third in 2004. Email addresses 1 & 2 forward to email address 3. I get a lot of email. 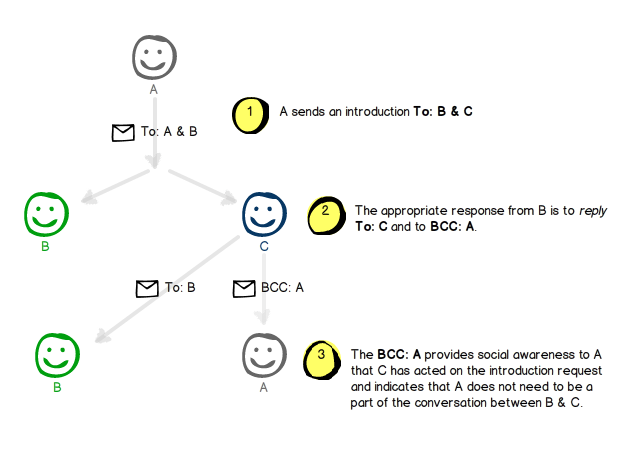 And the “count me in”, “+1” behaviour adds zero signal to email conversations when used with the “Reply All”. The other thing that has been driving me a little batty is the Introduction. I am trying to follow the advice of David Cohen and Fred Wilson, aka The Double Opt-In Introduction. On blind introductions, I try to ask each person to “opt-in” to the introduction to the other. This requires additional email, but it also requires that I separately compose an introduction email with relevant information (think LinkedIn profiles, Twitter accounts, URLs, etc. ), my reasons for why I think the connection is valuable to both parties, my expected action from the recipient, and an expected/requested timeframe for action. Once both parties have “opted in” I add both to the “To:” line of a message and include the previous information, my reasoning and the desired actions and timeframes. (Okay, I don’t always do the double opt-in. I don’t do blind introductions. But there are situations where people ask for intros to friends, and if I know the friend has an open policy on these introductions I will do a bit of diligence and make the connection). The breakdown that I’m seeing is post introduction. When the 2 parties reply to each other. They continue to reply to or include me on the cc: to the conversation thread. What I would like to see instead is the initial respondent move me to the BCC: line. This provides social proof that the individual has received and acknowledged my request/introduction. But allows me to not participate in the ongoing conversation. What are other email tips?